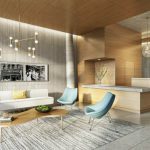 The far east side of Manhattan just got a whole lot swankier, thanks to the release of the Penthouse Collection at 20 East End Avenue—two highly-anticipated penthouses within a condo building designed by internationally renowned architect Robert A.M. Stern. 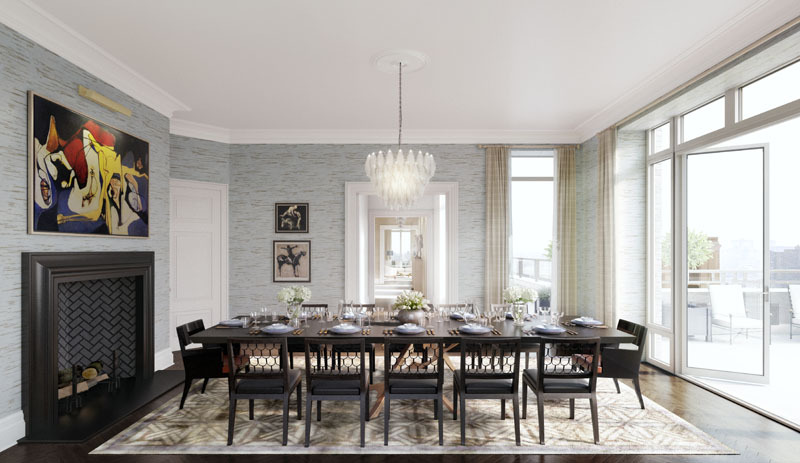 Located at the corner of 80th Street and East End Avenue, the Penthouse Collection includes two newly available residences that together total $62 million. 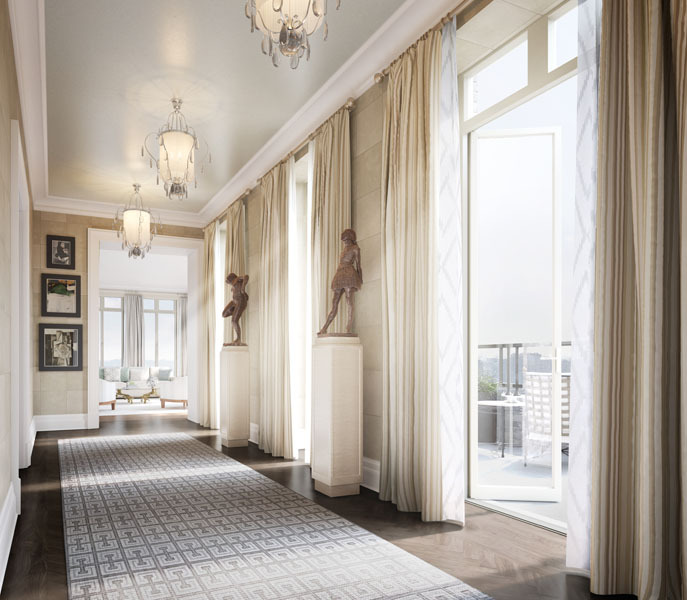 Two of the most remarkable residences available on the Upper East Side today, Penthouse A and Penthouse B are available for $35 million and $27 million, respectively. Located on the 18th floor, Penthouse A is the uppermost residence, featuring over 6,000 square feet of interior space and an additional 4,500+ square feet of private terrace space. This five bedroom, five-and-a-half bathroom residence has direct elevator entry, a separate, dedicated service entrance, four wood-burning fireplaces, ceiling heights up to 11 feet, oversized windows, and four incredible, private setback terraces on the main entertaining floor. The expansive private roof terrace has 360-degree views of the city and the East River, and also has gracious “outdoor rooms,” including one with an oversized wood-burning fireplace. 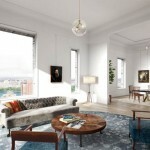 At approximately 6,300 square feet, Penthouse B features a 330 square-foot private terrace space. 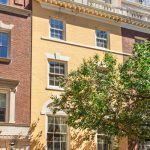 This five bedroom, five-and-a-half bathroom residence also includes direct elevator entry, a separate, dedicated service entrance, three wood-burning fireplaces, ceiling heights up to 12 feet, oversized windows, and one large south-facing private terrace off the formal dining room. 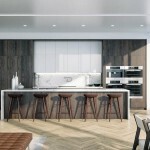 The interiors of both residences were designed by Robert A.M. Stern Architects and feature quartersawn Appalachian white oak herringbone floors in a dark walnut finish and custom casings and moldings. 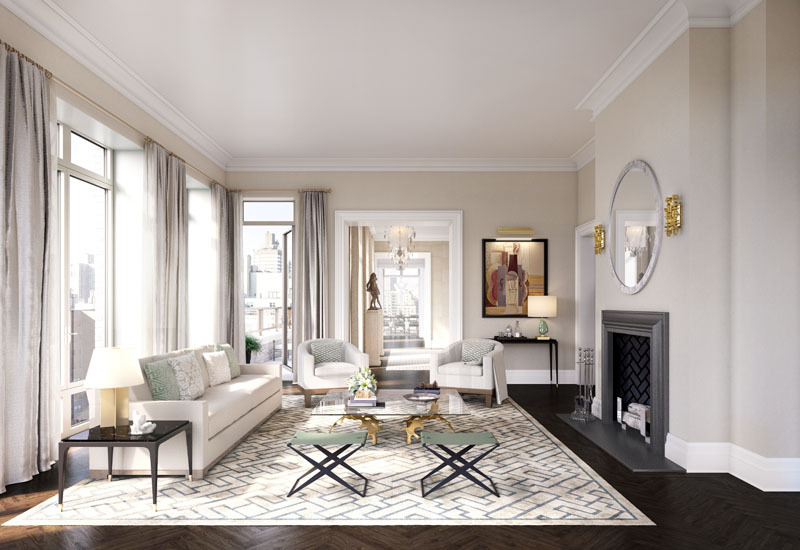 The homes feature gracious corner living rooms with a wood-burning fireplace, direct access to a private terrace, and highly coveted south and east exposures facing the East River. The light filled penthouse entrance galleries include generous wall space to display one’s private art collection. The dining rooms, each of which opens onto a south-facing setback terrace, also include custom paneled interior doors designed by Mr. Stern, and a wood-burning fireplace. 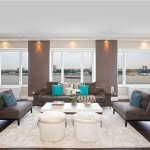 Each penthouse also includes a library and a family room. Extra-large open chef’s kitchens include oversized windows or exposures to brilliant natural light. The cornerstone of the kitchen design is a custom burnished nickel stovetop hood, accentuated by a subway tile backsplash in a crackled finish. A slate grey island, with an imported Brazilian granite countertop, serves as the focal point of the kitchens. A top-of-the line Gaggenau appliance package features a seven-burner gas stove, wine cooler, speed oven, wall oven and a dishwasher.